International Business Machines (IBM) said Tuesday it authorized an additional $10 billion in stock repurchases, raising its total share buyback program to $12 billion. 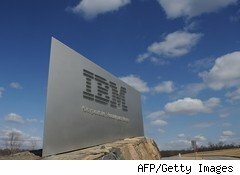 IBM also declared a regular quarterly cash dividend of 65 cents a share. "IBM's higher value, higher margin business strategy has enabled the return of $91 billion since 2003 to our shareholders through share repurchases and dividends," CEO Samuel Palmisano said in a media release. "We've done this while investing to bring new products and services to market, and expanding IBM's business into new, emerging markets." Big Blue had about $2.3 billion remaining under its prior repurchase program at the end of September. The company said it expects to request additional share repurchase authorization at its board meeting in April. IBM's quarterly dividend is payable Dec. 10 to shareholders of record as of Nov. 10. IBM said last week its third-quarter earnings and revenue topped Wall Street estimates, but concern over the services business continued to linger. Shares in IBM, a component of the Dow Jones Industrial Average ($INDU), are up 7% for the year to date.